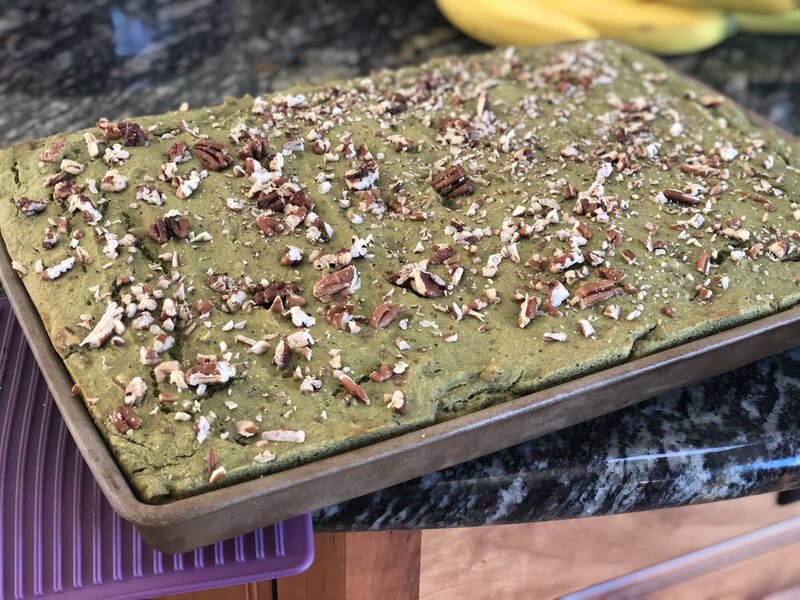 Banana bread is one of my favorite treats and even though I have my tried and true recipe I usually follow, we decided to change it up a bit and use some of our yummy kale. Corn chopping is almost over so we decided to try to a new recipe on the guys. The color of these are a little interesting but the taste is amazing! I think they will be super fun for holidays like Halloween, Christmas, and St. Pattys Day!!! We took this recipe from Marci Lutsky’s Vegging at the Shore. Her recipe is for making mini or regular muffins, we decided to double the recipe and pour it into a 9x13 bar pan. This is another great one for a Vitamix or other blender… makes it super fast! We had some Macintosh apples from the garden so decided to make our own applesauce. Ronna cut about five cups of apples and a cup of water to make the applesauce. The recipe calls for unsweetened sauce so we didn’t have to add anything to it! It made extra so we put the applesauce aside and started the main recipe! Put the kale, bananas, and the wet ingredient in the blender. We added an extra banana and and extra egg since ours were on the small side. Blend until a smooth consistency. In a separate bowl combine all the dry ingredients. The original recipe calls for chia seeds- which would’ve been amazing- but we were out, so we substituted with poppy seeds. Combine the kale mixture with the dry ingredients and stir. The combined mixture will be thick, like a pancake batter. If you are making muffins, Spoon them into your tin and cook them for about 12 minutes. We decided to make bars- since we were out of nonstick spray and it is easier to oil a pan than all the individual muffin spots. We decided to add some pecans to the mixture since I usually do in my banana bread. We also didn't have maple syrup so we substituted honey instead, still fabulous! The more I cook with my mom the more I realize we don’t always have to follow the recipe exactly… sometimes you just have to make do with what you have in the kitchen :) Just like life doesn’t always go according to plan it still turns out just as good or even better! These turned out super moist! I thought they might be super dense but they were actually fairly fluffy. I am still undecided about the poppy seeds - I feel like maybe we should have added more or just skipped them all together. I might not make them every time I have ripe bananas but they are something I will definitely make again! Let me know if you try making theses and what changes or substitutions you try! Preheat oven to 350. Combine egg through vanilla extract in a blender or food processor until well blended. In a mixing bowl combine flour through salt with a whisk. Add wet mixture to dry ingredients and stir with a spoon. Will be thick, like a pancake batter. Spoon mixture into muffin tin that has been greased or sprayed with cooking spray. If using them, cover tops with pecans. If making mini muffins cook for 12 minutes. If making regular muffins, cook for 17 muffins. If using 9x13 pan cook for 20 minutes. Cool and enjoy!